I had a mixed experience with Mirage; I enjoyed some elements, and I found others frustrating. Amani’s home planet is dominated by the interstellar Vathek empire, and she can’t remember life before the occupation. She is nothing special, one peasant girl of many, but she has family, friends, and the cultural traditions the Vathek are trying to stomp out. Then, she’s kidnapped and taken to the place, where she’s to serve as a body double for the half-Vathek Princess Maram, the heir to the throne of the Vathek empire. Mirage is a very character-focused novel. It’s not big into action sequences or the like; the majority of the book is comprised of character interactions and subtle growth. There are three major characters: Amani herself, Maram, and Idris, Maram’s politically-arranged fiance and Amani’s love interest. Amani and Maram are both interesting characters. Amani could easily blend in with other genre heroines, but she is well enough characterized to be distinct. Of particular note, her faith plays a large role in her life, which isn’t something we see with many genre protagonists. Maram begins a clear-cut villain, cruel and abusive to those around her. But Amani (and the reader) slowly come to have some empathy for her — in the Vathek culture she’s been raised in, she’s been made to hate herself. Basically, Maram’s got a ton of internalized racism that she acts out on the people around her. The relationship between her and Amani is the most interesting part of the novel. Then there’s Idris. He comes from a lineage that ruled the planet before the Vathek invasion, and most of his family was killed in Vathek purges. He and the other remaining pre-Vathek nobility have a very tenuous position, and he’s been denied his cultural heritage in a way Amani was not. I did appreciate the way that Idris showed another facet of the Vathek invasion, but I wasn’t a fan of the Amani/Idris romance plotline. Part of this is surely just me and my usual apathy towards fictional romantic relationships. As other reviewers have pointed out, it also veers close to insta-love territory. They spend two weeks together, meet twice more (briefly), and then declare their love for one another. My eyebrows were raising. As you may be able to guess by the synopsis, Mirage is technically science fiction but probably owes more to the fantasy genre. A good comparison would be K.B. Wager’s Behind the Throne. You could actually make some fairly light edits and have it be complete fantasy, not science fiction. The sci-fi elements were mostly superficial — mention of intergalactic laws, droids as servants and soldiers, transport ships, etc. This didn’t bother me, and it provides territory for the sequel to explore. I do question the preponderance of monarchy… it’s one of those SFF stories where the focus is on who’s the hereditary monarch, with no question of whether monarchy itself is what’s right for the oppressed masses. It’s a problem with many SFF stories, and Mirage doesn’t deviate from the standard line or examine it in any compelling way. With one other criticism (which I’ll get to shortly), I enjoyed the world building of Mirage. The setting and Amani’s culture has Moroccan influences, and the story itself is inspired by Moroccan history. I’m not well enough versed in Moroccan culture or history to say much more than that, but I did find the setting to be detailed and immersive! I get a sense of how Amani’s people live, what they believe, and what’s important to them. Back to my one other criticism… Mirage makes some weak nods towards dealing with gender issues, mostly by having the pre-Vathek culture be matriarchal. But it is also incredibly, mind-numbingly hetero- and cisnormative. There is not one single line anywhere in the book that would lead me to believe Duad even knows queer people exist. All romantic or sexual attraction or relationships ever mentioned are between men and women, and gender is always binary. In a book as focused on culture and marriage alliances as Mirage, this exclusion is rather glaring. I saw some other reviewers saying that Maram should have been a love interest, and that’s not even what I’m talking about here. I’m asking for the bare minimum, which isn’t a queer lead. My bare minimum is the acknowledgment that queer people exist. It is 2018, and I am no longer going to swallow down frustrations about this topic. When a book like Mirage fails to acknowledge the presence of a whole segment of the population, I’m going to start mentioning it. From here on out, all SFF books that act like queer people don’t exist will have me talking about that in my reviews. While I am frustrated by Mirage‘s blithely heteronormative viewpoint, I still am planning on reading the sequel. I thought it handled themes of colonialism and oppression much more deftly than the many other YA SFF novels that have similar setups, and I’m invested in Amani’s story. 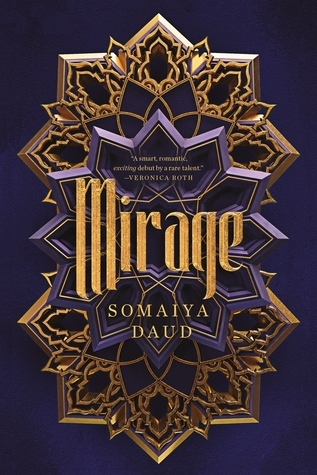 For various reasons (I also would have liked at least a bit more action or political intrigue), I’m not going to give Mirage a fully enthusiastic recommendation, but I will say that it is a story worth consideration. Great review! A lot of SFF books dealing with culture totally forget or silence any existence of LGBTQ+ relationships or community… I feel that this is why recently people tend to emphasise on this point because nowadays the LGBT+ community is considered to be part of societal and cultural structures (Even with homophobia and discrimination they are part of our culture and they cannot be negated) but sadly only a few SFF books are dealing with it. What I found a bit disappointing is that while it is understandable in an action-packed book it is less with a character-centric book where characterisation and world building is at its core. Yes, I ran into the same thing with the sci-fi book I read next, but it was a bit less noticeable because it was literally one action scene after another with only three or five characters. Yes in action packed books it is not really as important to be detailed on culture and communities.